After many thousands of questions regarding plastic, or as they are sometimes known – upvc, we are pleased to present a project featuring conservatories which fit the bill in all areas of the decision process. To build a conservatory yourself, you must first make sure your measurements are absolutely accurate for the space that you have allowed for the conservatory. Most conservatory parts come with a 10-year guarantee but this will be invalid if your measurements are wrong and the conservatory does not fit the base slab that you are going to lay it on. If you attempt any alterations yourself, you may invalidate the guarantee. Once you have selected and measured the area that your conservatory is to be installed into, the next decision that you have to make is what design you want to go for. Some typical designs are stated below. The majority of DIY Conservatories are modular in nature meaning that it is a conservatory that is made up of standard size parts which fit together to form an attractive conservatory of a pre-defined shape. With some manufacturers (but not all) some of the module parts that make up the conservatory are interchangeable which means that for example the french doors can be positioned in any location within the conservatory frame if required. When selecting your DIY Conservatory the specifications that you choose will very much depend on what you intend to use it for. For example if it is going to be used as a study it is likely that it will be used nearly every day and therefore it’s worth considering the best and most energy efficient glazing and roofing materials to ensure that the bare minium of heat is lost during the colder months of the year when the heating may be on for most of the day, every day. If it is going to be used as an occational use dinning room then heating every day may not be a huge issue. 25/35mm thick polycarbonate roofing – Polycarbonate should be used for the roofing of your DIY Conservatory as it gives both good thermal insulation and also is very cost effective. Glass roofing – If you are not sold on the prospect of polycarbonate roofing then glass roofing is an option and recent developments in technology has now allowed glass roofing to equal and in some cases out perform polycarbonate roofing, depending on the manufacturer. The best glass roofing will also feature a self-cleaning coating. Opening fanlights with shootbolt locking – If you have a well insulated conservatory this can sometimes backfire a little in the summer months so it’s good to have the ability to ventilate your conservatory through fanlights. 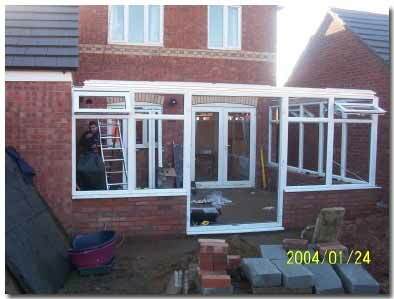 70mm internally beaded double reinforced internally glazed frames – There are some manufaturers that still use 60 and 65mm external bead frames. These are not as energy efficient as 70mm internal frames and the fact that the bead is on the outside makes them less secure also. Fitting kit and full instructions – If you are building your DIY Conservatory yourself then all the required fixings and full and complete instructions are a must. No more than 50% of the original land around your house can be covered with additions. If your property faces a highway then your addition cannot extend beyond it’s principal elevation or side elevation. Advantages – Concrete pouring and wall construction is fairly easy and can be a DIY job. If not there are a huge number of builders able to do this. You can also use the same bricks/blocks/stone as your house to construct your dwarf wall meaning that everything matches and also your dwarf wall can be built in such a way as to give you the best possible insulation values. Disadvantages – The wok ethic, quality and cost of a builder to do the construction for you can vary hugely and there can be a huge amount of disruption to your home with skips, concrete lorries, building materials and broken glass. Also known as "Steel Bases" this option is fairly new but is growing in popularity especially with DIY’ers. Using this method almost anyone can complete the job from start to finish without the need for a builder. They come in the form of a pre-fabricated base and wall. The base and wall sections them selves are constructed from galvanised steel to prevent rusting and corosion and the walls are made using "brick effect tiles" that are bonded to the steel frames. Advantages – They are quick and easy to install and create the miniumum of disruption during construction and due to this they are also ideal for areas with restricted access. An added advantage is that most manufacturers also build service channels into them allowing for cables etc…. Disadvantages – In most cases only a standard range of brick designs are available limiting compatability with the look of certain properties and pre-fabricated bases cannot achieve the same level of insulation as a well constructed base and brick wall. As you may suspect building your conservatory yourself is the most cost effective method and as mentioned, if you select a DIY Conservatory with full instructions on how to do it yourself and also posses the necessary skills in order to do it yourself then you are laughing! Check the area that you are going to build your conservatory is completely clear of debris and also ensure that there are no tree roots below the surface that could potentially come up later to crack the floor slab or to damage your pre-fabricated base. If you are employing a builder to lay your base and build a dwarf wall this will save time for them and save you money also. Which ever base you have chosen (concrete or pre-fabricated), the next step is to lay this. 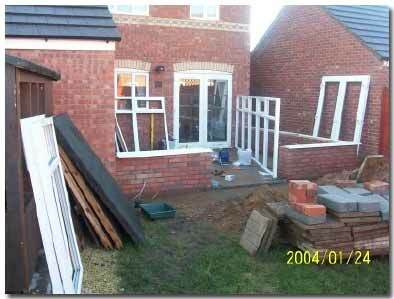 The size of conservatory your are building will have a bearing on the type of base you lay. 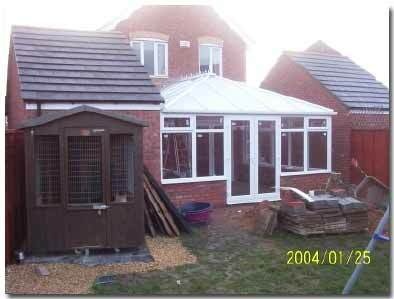 Check the type of base you will need with the manufacturer of your DIY Conservatory kit. When setting out the base you will also need accurately checking each corner to ensure that it’s square. 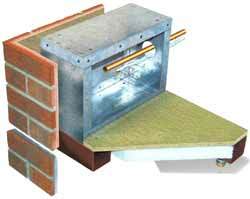 Also, do not forget about the damp proof course and install when required. 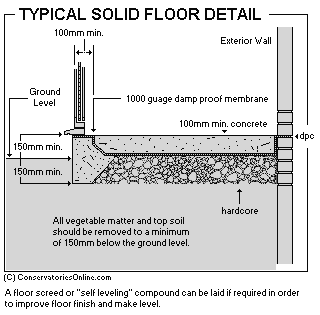 With a concrete base, a damp proof membrane will be required below it and with dwarf walls, a damp proof course will be required above ground level (see images above). With pre-fabricated bases and walls you will need to refer to the manufacturers guidelines for damp proof course/membrane specifications. Once the base has been layed and had time to dry you can now construct your dwarf walls if they are required. Use our DIY how to project laying bricks for guidance on how to do this correctly. If you require electrical sockets, ceiling fans, phone lines etc…. 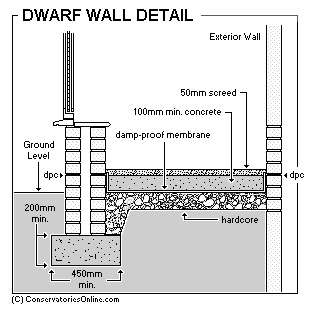 to be installed it is worth considering these while constructing your dwarf walls. For information on requirements contact a qualified electrician and tell them what your are doing and they should be able to offer you help and advice in terms of what stage these items can and should be installed at. Having designed the conservatory make sure you have a copy of the drawings you gave to the manufacturer for reference. Once you have layed your base and received your conservatory kit in full, use the drawings to check you have all the elements required. Next, layout all the frames in the positions in which they are to be fixed to make sure you have all the items you need and also that will all fit together. Once you have ensured that everything fits together as it should you can now begin construction. All the fixings required should come included with the kit. These will in most cases be types of bolt or frame fixings. Check each opening is correct as you build. With all the frames now fixed securely in place you can start to fit the window glass and beads as per instructions. 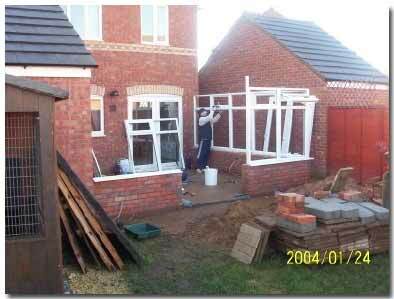 See out double glazing how to project for guidelines on how to do this. Seal all joints as directed by the manufacturers instructions. For help with how to use a sealant gun see our using a sealant gun page. 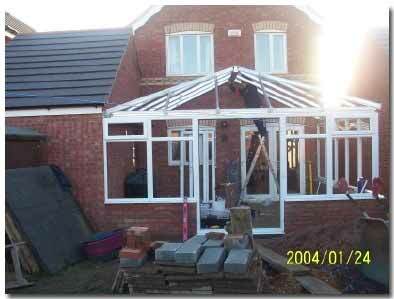 With your DIY Conservatory now constructed in full you can decorate to your requirements. We would also like to thank www.u-fit.co.uk for letting us use some of their images to help explain the processes involved in the construction of a DIY conservatory.